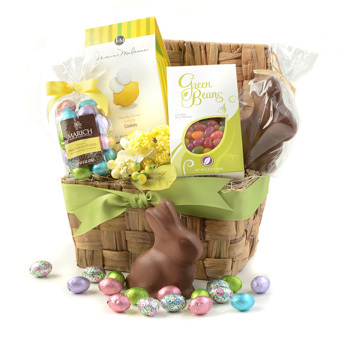 You're sure to see a smile on Easter morning when you give this charming basket nested with spring-time treats! Lemon tea cookies, all-natural jelly beans, a generous bag of festively wrapped milk chocolate foil eggs and a chocolate bunny will get this special day off to a perfect start. EMVI Chocolates - Chocolate Bunny: This precious semi-solid bunny is handcrafted from premium chocolate in upstate New York. Please specify milk or dark chocolate. J & M Foods - Lemon Tea Cookies: Tart, citrusy cookies dusted with powdered sugar - the perfect bite for lemon lovers! Marich Confectionery - All-Natural Green Bean Jelly Beans: Made with fruit juice concentrates and colored with natural fruit and vegetable extracts for a pure, delicious treat! Medium Natural Hyacinth Basket, 9" x 6" x 5"